In the winter of 1999, when the gorse and gum trees were cleared from the land over the water race, I had my first real chance to choose and plant new trees. Serious research was called for! This was no bargain bin stunt, this was the real thing - planning sensibly for the future. I knew my purchases might prove to be costly mistakes, but I wanted to plant trees that I like. I would enjoy seeing the new trees settling in and starting to grow and spread. I found that a lot of tree catalogues assumed rather a lot of previous knowledge - some didn't even carry any pictures. And I am not known for having a good tree imagination. My favourite trees of all are the Dogwoods (or Cornuses). I have several smaller varieties planted in Middle Border over the water race. Tucked in the spaces between the Pittosporums is a Cornus Florida which is growing well. 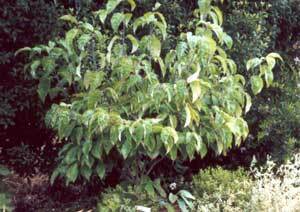 Not so sturdy is the Cornus Stokes Pink in the grass nearby. Its leaves unfurled alarmingly late in its first summer, and I wondered if it would survive (of course it did). In the back of the border is a multi-coloured Cornus Cherokee Sunset. It's a pretty tree, and seems happy enough, and its leaf colour mix is very extreme. The overall effect of the variegations will be amazing when this tree gets larger. A favourite established tree is the lovely Golden Elm by the driveway. It has special significance as the first cat burial on our property occurred under this tree. 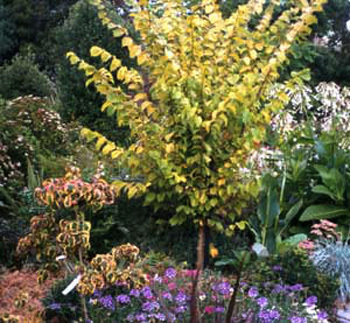 I've planted a new Golden Elm in the Dog-Path Garden - already the branches are spreading out and up to the sky. This is Stephen's favourite type of tree. Two red Maples and a Robinia Casque Rouge complete the new tree plantings in the border. Initially the Maples were a little ragged, as they needed more shelter from the southerly storm winds here - the line of shelter trees on the paddock fence were soon able to provide that. This area will eventually be a beautiful small woodland border - well, that's the plan! 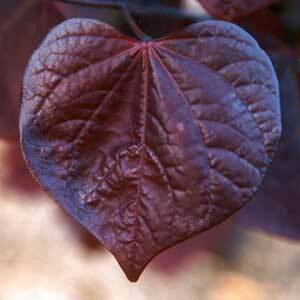 I've always admired the small tree Cercis Canadensis Forest Pansy, so I've planted one in the Dog-Path garden. I like the summer leaf colours of forest green and dark red, and the leaf shape. As a tree-ling it complements its pale pink rose neighbours, and maybe its eventual size will still accommodate them. There will be an issue of shelter, just as there is for the Maples, but my fingers are crossed. All trees except one are thriving. The Robinia Casque Rouge proved too brittle - well formed branches kept breaking off in the wind. It has been cut down, and a Magnolia Grandiflora has taken its place. 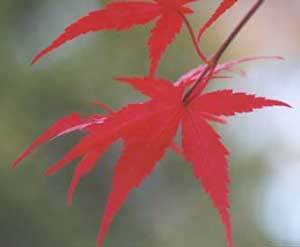 The Maples are thriving, as are the Dogwoods - growing slowly, and always looking beautiful. And the Oak Grove with its daffodil underplanting was swallowed up by garden!